Disposable coffee cups continue to be a huge source of waste in the US. Coffee drinkers use billions and billions of coffee cups each year. And while we love reusable and recycled cups, a new company has come up with a more interesting solution: plantable cups. 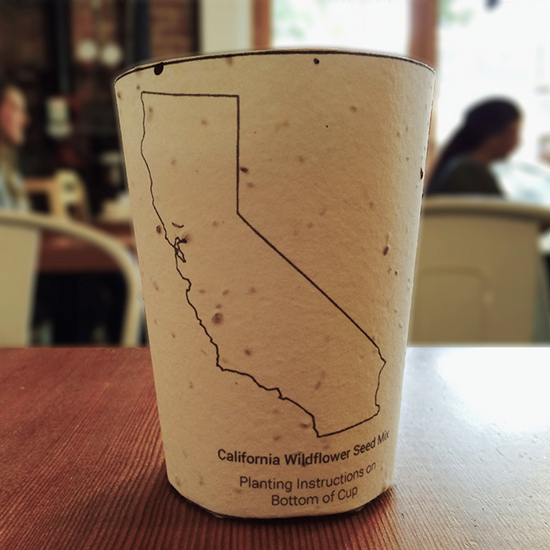 Cal Poly student Alex Henige has developed a line of paper cups with seeds implanted in them. When you are done with your morning cup of coffee, simply soak the empty cup in water for five minutes and plant it in your garden or anywhere else that could use more greenery. Henige has outfitted his cups with a variety of wildflowers and tree species that he says can help reforest areas that have suffered from either fire or over-forestation. Interestingly, he claims that while recycling cups is wonderful, most of them ultimately end up in landfills anyway. The fibers in the paper can only go through the recycling process three times before they are no longer soft enough to use, and no matter how well-intentioned we might be, we have to throw them away. Henige has already made a plantable prototype and is currently running a Kickstarter to fund the first round of cups in Marin County, California, and Boulder, Colorado. He will hopefully partner with local coffee shops there to carry the cups and get them into the hands of their customers. As of this writing, Henige has raised more than $8,800 of the $10,000 he needs with almost two weeks remaining. To contribute, head over to his website here. If the rest of the country drinks as much coffee as we do, these cups could create a whole new ecosystem.